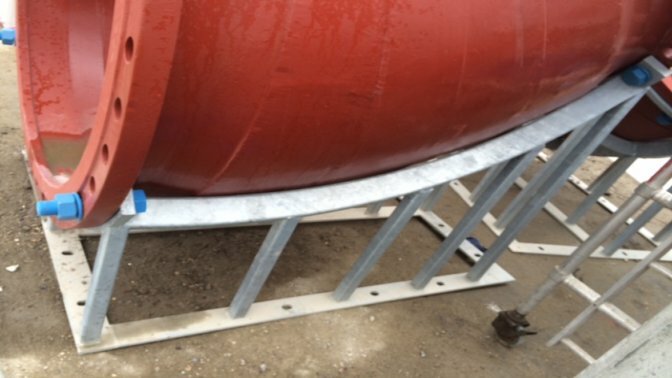 A slightly unusual project for Alpha Rail to be contacted about, but Phil Green, an ex employee, recently asked if we could manufacture some steel cradles to help support some very large sewerage pipes being installed as part of a regeneration project being carried out at Beckton Sewage Treatment Plant in East London. In 2014, Thames Water completed a £675m project to modernise and extend London’s major sewage treatment centres in a bid to significantly reduce untreated sewage and protect the environment. As part of their continued efforts to improve the environment, Thames Water is currently in the process of building the Thames Tideway Tunnel which is part of the London “super sewer” project. The initiative involves building a 15-mile-long sewer that will run beneath the River Thames which will aim to capture millions of tonnes of sewage that would otherwise be left to flow into the river system. The tunnel will then transfer the sewage to the Beckton water treatment works where it will be treated and returned as clean water safely back into the River Thames. In order to cope with the increased sewage, Beckton is currently undergoing major redevelopment to be able to collect nearly all of the 18 million tonnes of sewage that pollutes the tidal River Thames in a typical year. 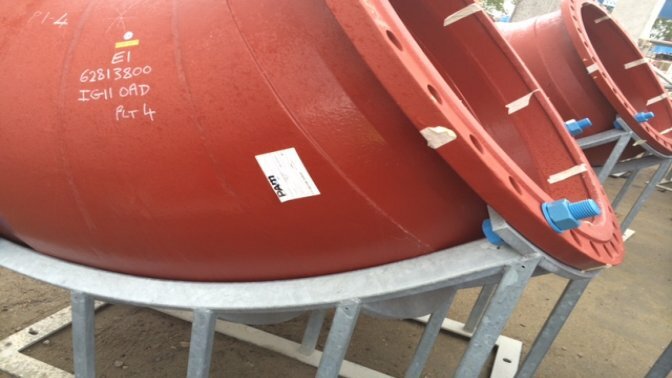 Knowing that Alpha Rail are metalworking specialists who can fabricate almost anything in steel, Phil contacted us to manufacture and supply bespoke metalwork that would be capable of cradling a 1400mm diameter Saint Gobain PAM ductile iron pipe. The cradles were required to act as “duckfoot” supports for the vertical pipes prior to being cast into a concrete platform. We had to take into account many key factors, such as overall weight, weight distribution and any subsequent transporting issues.